Google Photos will store all your photos and sync them with all your devices, and you don't need Google+ any more! 1. So what is Google Photos? Google Photos is so similar to Apple Photos it's uncanny – but where the Apple product is locked into, well, Apple products, Google Photos works on both Android and iOS and offers unlimited storage, albeit with a resolution restriction. 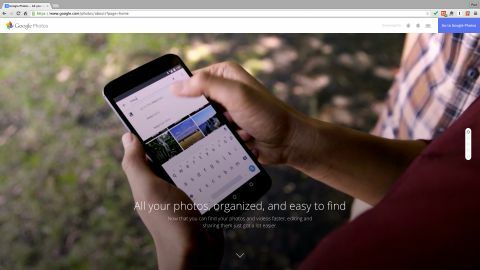 Google Photos was announced at the company's Google IO 2015 event in San Francisco, and it offers photographers free, unlimited storage (with file size restrictions – see below) and the ability to see, organize and edit their photos on any device, anywhere. It's a standalone spin-off from the Google+ Photos service, so although the basic premise is similar, you no longer have to subscribe to Google's complex and unloved social networking platform to save, show and manage your photos. There's a heavy tie-in with mobile Android devices and the whole Google ecosphere, but this is more than just a social tool for smartphone users. Regular camera users can use Google Photos to back up, share and edit their pictures too. The process is designed to be automated, so whether you shoot pictures on your phone or add them to folders on your computer, they still end up safe and sound on Google Photos without you having to lift a finger. You can browse your photos grouped by date or view them as Collections created automatically by Google Photos or manually by you. If you want to show other people your photos you can swipe through them individually. Google Photos also comes with some basic editing tools. There is an important limitation. You only get unlimited storage if you let Google compress and resize your photos. This is the same system used by the old Google+ Photos service – the difference here is that Google+ restricted you to images 2048 pixels wide or high (somewhere around 2-4 megapixels), whereas Google Photos raises that to 16 megapixels. This will be fine for smartphone photographers, but if you use a DSLR or compact system camera with a sensor larger than 16 megapixels, and especially if you shoot raw files rather than JPEGs, Google Photos is not going to be a proper backup system – it'll still be useful for sharing photos and checking them out on any device, but you'll need to archive your full-res originals and raw files elsewhere. Actually, you can upload full resolution originals, but this will count against your Google Drive allowance – this is how Google+ Photos worked too. When your Google Drive fills up you can upgrade but you have to pay. With that in mind, it's worth remembering that Google Photos is not the only game in town. It's new for Google, but that doesn't mean no-one's done it before. See our Google Photos alternatives at the end of this story. If you've got a Google account you can start using Google Photos right now. If you're on your computer, go to the official About Google Photos page. When you've taken it all in, you can click on the 'Go to Google Photos' button top right. If you're already logged in to your Google account, you'll see all your photos so far. If not, you'll need to log in – and if you have more than one account, choose the one to log into. Each Google account has separate photo libraries. This is what you see in your Google Photos mobile app when it's synchronizing. The sync badge in the bottom right corner of the thumbnails shows photos in the queue for synchronization. If you're on your mobile device, download the Google Photos app (it's on both Android and iOS) and use it to log in to your Google account. Now sit back and wait – and then maybe wait some more – while your mobile device and your Google Photos account figure out what to synchronize and in which direction. If you have a lot of photos on your mobile device, you could be in for a long haul – but this initial synchronization should be a once-only process; after this, it's only new photos which will need synchronizing. If you like, you can watch what's happening in the mobile app. Image thumbnails with no badge have been synced, those which are waiting will have a circular sync badge in the bottom right corner, and those just synced with briefly show a tick in a cloud. Nice symbolism. Current page: So what is Google Photos?